in February 2009 - Photo by Jim Hollis. Irchester’s housing problem was again dealt with by the Wellingboro’ Rural District Council at their meeting on Wednesday, when the Clerk gave particulars of the proposed answers to the queries made by the Local Government Board with reference to housing in the district. To the question whether any houses were required the Clerk suggested the Council state that Irchester required 20 six-roomed houses. Mr J C Turner (Irchester) said that Rushden was as badly off for houses as Irchester. Mr Dunkley said his question was: Would there be enough house accommodation in Irchester if the Rushden workers lived in Rushden? If so, he did not see why the Rural District Council should do work which the Rushden Urban Council should perform. Mr Turner said that the people who worked at Rushden were Irchester people, and were bound to go out of the village to work. Mr Tomkins asked if it was the Irchester Parish Council that recommended 20 houses or only the sub-committee, but the information was not forthcoming. He suggested that this particular question be left over until a reply had been received from the Parish Council. He hoped the Rural District Council would not build houses. It was eventually decided, on the proposition of Mr Turner, seconded by Mr E Parsons, to fill in the form as suggested by the Clerk. We understand it has been decided that the new national housing scheme shall be directed by the Local Government Board. The returns already received from the city, borough, town, and district councils throughout the country show that about 100,000 new workmen’s dwellings are urgently required, but we are able to state that from 150,000 to 200,000 will be erected to meet the after-war conditions. It was stated at the Local Government Board this week that the Government would be asked to grant a subsidy of several million pounds for the purpose. The type and size of the houses will vary according to the district in which they are built, but all the parts will be standardised from the bricks to window fittings. In every possible case gardens will be provided, the cultivation of which will be of national value in the years of food shortage which will follow the war. Local authorities are being urged to adopt a standard system of planning with not more than twelve houses to the acre. At the meeting of the Rushden Urban Council on Wednesday, a report was received from the Finance Sub-Committee appointed to consider the circular from the Ministry of Health regarding further housing. The Chairman (Mr. L. Perkins) said that the circular was intended to encourage people in the various localities to go on with building privately, whatever the Councils might do. The Ministry hoped there would be some individuals who would speculate in building houses for themselves. Almost the only building which had been done in Rushden since the war had been done by the Urban Council. The Government offered £6 per year for each house for 20 years, and the Urban Council had power to extend this from the Council funds. The Government’s offer, which could be had in a lump sum, at 4¾ per cent, would be £76 7s. 8d. per house. This meant that a person who wished to build a house, provided he conformed to the regulations of the Ministry, could have from the Urban Council an immediate cash payment of £76 7s. 8d., besides any amount which the Council agreed to add. The Council, for instance, could make it up to £100. The grant was not to build villas or one-roomed cottages, but houses something like the type erected by the Rushden Council since the war. With that restriction, the Government were prepared to pay this money; but the Council might raise a loan, from which to pay out to individuals who erected houses a certain sum, which might be greater than the actual cash payment the Council would receive from the Government during the next 20 years. If the Urban Council made up the grant to £100, it looked like giving away £24 to every house, but they must remember that each house would bring in rates, and the more vacant plots were filled up the better from the ratepayers’ point of view. The question of the exact amount of the subsidy would have to be dealt with by the Council. In some districts £100 had been promised. Plans would have to be submitted to the Urban Council, and the houses would have to be completed by September, 1925, so that this offer was not a permanent one. He took it that the offer would not be renewed. The grant was a safeguard against a possible depreciation of the property in the future. of his own. There are certain schemes by which this can be done if the man is prepared to pay a portion down. There are building societies which would advance a great deal. I think it would be to the interest of the Council to further any such development. Mr. F. Knight said that before the Sub-Committee could complete their report they wished to know what subsidy the Council would give beyond the Government’s offer. Then they could get into touch with the building societies, etc. In reply to Mr. Horrell, the Clerk said the Council would have to raise a loan and repay it in 20 years, and the Ministry would grant £6 a year for each house, so that the Council would have to pay, say, another 30s. a year. Mr. Horrell: I think a number of people would take advantage of this offer, and each house would be an asset to the town because each would pay rates. Mr. T. Wilmott: As one who has built houses in the past, I think this is the right way. You are more likely to get houses in this way. At Rothwell they decided to make the grant up to £90, another place £95, and another £100. I hope the Council will do something in this respect. Mr. Coles: I should like to see the subsidy made up to £100. I think a public meeting should be called, at which questions could be asked. If this scheme is a means of increasing the number of houses in the town it will be a blessing. Kettering and Wellingborough are making up the grant to £100. Mr. Corby thought it was a step in the right direction. Mr. Horrell moved that the Council be empowered to make up the Government subsidy to £100. Mr. C. Claridge seconded, and it was carried unanimously. Mr. Horrell: I hope the Sub-Committee will go on with their investigations, and make the best possible terms with the building societies. Mr. Knight suggested that the Sub-Committee should complete their scheme and then lay it before the Council. The anxiety expressed at last week’s meeting of the Rushden Urban District Council has been dispelled by a letter from the Ministry of Health, authorising the erection of 56 small houses on the road now in course of construction near Tennyson-place. It is understood that the sanction came through in the ordinary way without any further pressure by the Council, whose appointment of a deputation to visit the Ministry has proved unnecessary. Huge increases on the costs anticipated in connection with the advance preparation of permanent housing sites are beginning to surprise and alarm the councils of this district. It appears that figures mentioned in a government circular last March will be almost doubled. Some of the first hard figures were presented to Rushden Urban Council last week and were passed almost without comment. The cost of preparing the Higham-road site was given as £13,461 - £9,432 for roads, £3,090 for storm water sewers and £939 for foul water sewers. “Roads” includes carriageways and kerbing, but not footpaths. As 140 houses are to be built on the site, the cost of site preparation is just over £97 per house. Higham Ferrers, whose site for 156 houses adjoins the Rushden site, is to pay at the rate of £96 14s. per house. At Kettering the bill represents over £100 per house. The actual work has not begun at any of these three towns, which, with others, are co-operating in a group scheme with Kettering as the leading authority. The costs are shown in a bill of quantities that Kettering has issued recently. They contrast strangely with the prospect painted in a Government circular last year, when the possible cost was estimated at £55 per house. This estimate played an important part in the discussions at Peterborough last March, when the local authorities of the area were called together by the Government and told how, by working together in a group, they could place their contracts on a large scale, secure the service of the large contracting firms, and enjoy the inestimable benefits which would accrue from highly organised, experienced and mechanised service. The figure of £55 per house appeared in connection with a Ministry of Works specification quoted in a Ministry of Health circular. There was no compulsion to adopt the Government’s advice, but the Councils were told quite clearly that only by this means would labour be available for their sites. Some had their doubts, and disliked the “big business” element, but nearly all gave way before the weight of argument. Wellingborough, however, was an exception and is still outside the group scheme. Principle was adhered to in that contracts were secured on the basis of open tendering, and advertisements were inserted in trade journals. That principle was narrowed, however, by the Government’s statement on labour. It was at this time that the rosy picture began to fade. The Kettering Group submitted a “typical bill” based on a specification prepared by its technical committee, and the lowest tender received worked out at £71 10s. per house. Whether the Kettering, Higham and Rushden sites are other than “typical” is one of the questions arising from the latest set of figures. One comment on this point came from Higham Ferrers, where the “Echo and Argus” was informed that the Town Council paid a good price for its land because the site was considered a good one for economical development. Rushden has still to learn about the preparation cost of a second housing site. Higham ponders over the fact that the cost now quoted is equal to a rate of 1s. 8d. in the £ for site preparation alone. Preparation for gas, electricity and water services is no part of the contract. Higham Ferrers and Rushden Water Board went into the question of new mains on Monday and estimated that on the converging Higham and Rushden sites the laying of these would cost £1,300, on the Rushden Newton-road site £400 and on the Rushden temporary site in Park-road £300. As to the houses themselves, the cost is absolutely unknown and the time when building can commence is equally uncertain. Even the site work is not on the large scale envisaged by the scheme boosted by the Ministry of Health. It is progress at Irthlingborough, where council representatives on a recent visit found 37 men on the job and met no fewer than seven Ministry officials who offered little hope of any extra labour being made available. The prevailing picture, therefore, is of plenty of officials, plenty of disappointment as to costs, and, in the misty background, a very dim prospect of houses for the homeless. Because maintenance costs have increased a wholesale advance of Council house rents was ordered at Wednesday's meeting of Rushden Urban Council. The increases, which range from 5d. to 1s. 8d. will be made on 935 houses and prefabs. A report from the Housing Committee stated that present rents would not produce sufficient income to meet the outgoings during the next financial year, and it was estimated, that an additional income of £2,900 per annum was required to avoid an increased contribution from rates. The committee considered that It would be inequitable, for the rents to be further subsidised by additional rate contributions. Every endeavour had been made to adjust the rents equitably, having regard to the accommodation and amenities of the various types of houses. Mrs. Muxlow said it had always been the policy of the Council that an increase of the contribution from the rates beyond the statutory one should not be made. It would be noticed that the rents of the houses for old people had been left alone. Three petitions from Council house tenants against the recent rent increases have been received by the Housing Committee of Rushden Urban Council and were mentioned at the Council’s meeting on Wednesday. One was from 98 tenants in Highfield Road, Coronation Avenue, Chester Road, Boundary Avenue, The Crescent and Spinney Road, who considered that the increases were inequitable having regard to the relative amenities of the houses. The second was from 24 tenants in Trafford Road who, though complaining of the increase, state that they would be satisfied if electricity was installed at the expense of the Council. The third is an individual protest from the tenant of 146 Highfield Road. The committee reported with regret that they did not feel able to recommend any variation. “I am very sorry,” Mrs. Muxlow told the Council “but under the circumstances it is not possible to alter the rents.” The report was adopted without further comment. Interior decoration is to be carried out at 41 houses in Kings Road and at the 50 prefabricated bungalows. Here is a story that should make pleasant reading to hundreds of Rushden people. It concerns housing, a subject of considerable importance in the town since the end of the war, and carries the glad tidings that the local situation is rapidly being overcome. From 600 on the waiting list for council houses in 1946 the figure has decreased to a little over 300. Of these applicants, about 150 are considered as absolutely in need, for at least 100 are at present living in sub-standard cottages or flats. One hundred and fifty is not nearly such a formidable figure to tackle, and at the present rate of building the task might well be accomplished in well under two years. In 1945 there were 200 on the waiting list, and within twelve months the figure had jumped to 600. By 1947 the list stood at 500 and dropped 75 during the next year. The downward trend continued until 1950, when the figure rocketed back to 534. The most recent issue of the M.O.H.’s report  1951  puts the figure at 456. But unfortunately for the council the matter will not end when progress catches up with the waiting list. They will still have to face the difficult task of clearing the town’s slum area  something of which they were reminded at the last meeting. With the exception of a few individual houses which have been demolished or closed, little has been done in the matter since the war. It has been suggested that the job should be tackled soon and dovetailed into the normal building programme. The problem is to be discussed by the Health Committee very shortly following a report that is to be submitted by the Sanitary Inspector. A blunt warning on the dangers which may arise from piled-up housing costs is given to Rushden by the treasurer of the Urban Council, Mr. W. D. White. “When the present housing programme is complete, it is forecast, the annual rate for this service will be over 2s. in the £. The loan debt thereon will be round about 1¾ million pounds, and loan charges, although mainly covered by rents, will present a difficulty if houses cannot be let or a trade slump occurs. “Repairs’ expenses in spite of the increased statutory minimum contribution, will need to be carefully watched if the repairs account is to be kept solvent. Mr. White reports that after the initial shock of a rate increase of 4s. in the £ in 1951, the ratepayers responded very well, and the rate increase at the end of the financial year (March 31st, 1952) showed no marked increase. The output of houses was doubled over the 1950-51 figure, and the loan debt was increased by £110,000  rather more than the amount paid off housing loans since the Council first began to build houses. The Council owned 1,165 houses on March 31st  more than one-fifth of the town’s total number  and the net rent value was £33,791 per annum. From five in 1881, the number of people per house in Rushden now averages a fraction over three. Of a total civic loan debt of £789,130, only £22,000 arises from purposes other than housing. A "slum" clearance plan involving 23 properties in five areas, was mentioned at Rushden Urban Council's meeting on Wednesday. Mr. J. Allen described it as the first instalment of a scheme which would probably go on for five years. The first list of properties has not yet been presented. Electrical installations in the council's temporary bungalows are to be inspected every 14 months in future because they have been the cause of fires. The cost will be about ten shillings per house. Council house tenants are to be told that vehicles must not be parked on the grass Verges of the estates. 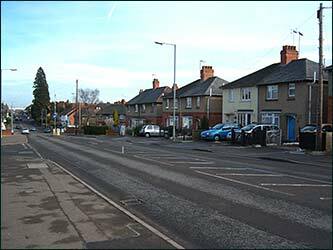 One room in each of the 621 council houses on the Higham Road and Irchester Road estates is to be decorated this year. The tenants will be given the opportunity to decide which room they want having done. When objections to the first instalment of Rushden Council’s property clearance programme were considered on Tuesday, Mr. A. G. Crowdy, clerk of the council, told Mr. F. R. Day, a Ministry of Housing inspector, that Rushden has 5,500 houses, of which the council owns 1,140. The objectors were Mrs. Haseldine, of Kettering, owner of No. 28 Little Street, and Mr. H. Pantling, of Leicester, in respect of Nos. 30 to 38 Little Street and No. 125 High Street South. For the council it was stated that the site was congested and had insufficient air space. Two of the cottages were unoccupied, and 11 people lived in the other five. There was only one entrance door to each cottage in Little Street, and except for No. 28 there was no inside water supply. After hearing the evidence, Mr. Pantling said he would withdraw his objection. Mrs. Haseldine did not attend. The inspector said he would view the property, and issue his report later. The tender of F. and R. Windsor, Ltd., for erecting 56 houses in Allen Road and Blinco Road at a cost of £73,726 were accepted. It was agreed to apply for consent to raise a loan of £75,550. The final plan was submitted for the development of land between Blinco Road and Hayden Road, required for the next section of the housing programme and the council agreed to apply for consent to raise a loan of £10,460 for site works and incidental expenses. A decision of the Rushden Urban Council on Wednesday evening meant a great deal to one Rushden family  the Brittins, of 37 High Street, applicants for a council house. There was more than the usual anxiety for a house; however, for the decision the council was being asked by its housing committee to make was to adapt a house now in the course of erection to provide certain special facilities. These facilities are needed, for Terry, 20-year-old only child of Mr. and Mrs. Rowland Brittin, who was struck down by a particularly severe form of poliomyelitis 14 months ago when he was serving with the R.A.F. in Scotland. After months in a Scottish hospital Terry was flown to England admitted to the Manfield Orthopaedic Hospital in February and now is due to come home. 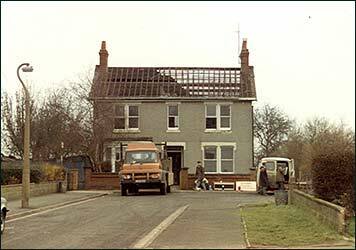 An ordinary home presents innumerable difficulties, however, because Terry has only the use of his head and left hand  the council’s housing committee recommended successfully at Wednesday’s meeting of the council that alterations needed in this case should be made to one of the houses at present being built. Terry’s progress during the past 14 months has been slow  and an additional complication was provided by the fact that at one stage he had acute appendicitis and had to be rushed to Northampton General Hospital for an operation. His mother told a reporter that throughout his illness and at one stage he was in an iron lung, he has remained cheerful. At various times when his condition has been critical he has been prayed for in all the churches and chapels of Rushden and had also been helped in his fight by the constant support of his parents, and the frequent visits of a large circle of friends. So much has his case meant to those who have come into contact with it that the matron of the Scottish hospital into which he was first admitted and the wife of the Commanding Officer of his old R.A.F. station, have kept in touch with his family and last week a special phone call was put through to him at hospital from the R.A.F. station where the C.O. and men wished him all the best for Christmas and the future..
Now Terry wants to come home where despite his illness he can be with his own people. That is why Wednesday’s meeting of the council meant so much to the Brittin family. Rushden Urban Council plans to build twenty houses, six single-bedroom type flats at the Hayden estate and 12 single-bedroom type bungalows during the twelve months beginning on April 1, subject to convenient sites being available. The programme was submitted to the council on Wednesday in a Housing Committee report which stated that, on January 11 38 houses and 12 flats were in course of construction. At the end of 1956 there was a large number of applications for old people’s dwellings, among them 19 from council tenants whose transfer would release two and three-bedroom-type houses for re-letting. A Housing Committee ruling, arising from a case in which the tenant had raised objections, was that proper provision for access must be made in all cases where tenants are permitted to erect garages. Complaints have been received about snow blowing under the slates of houses, particularly in the Westfield Avenue area. The question of “torching” over 700 roofs will be considered, but the cost might be as much as £5,000. Mr. G. Marriott said the work would have to be done over a number of years. Pre-war houses are to be surveyed with a view to improvements. The clearance order in respect of South Terrace has been confirmed and became operative on February 9. The cost of the upkeep of Rushden’s housing estates are analysed in a handbook just prepared by Mr. W. D. White, treasurer and accountant to Rushden Urban Council. In the financial year 1956-57 there were 1,559 homes to be maintained, and the repair bill came to £14,152  an average of £9 per house. This is how the money went: Plumbing £1,812, gas fitting £391, electrical repairs £88, bricklayers £828, plasterers £521, carpenters £932, roofs £838, fencing £655, gates ££259, footpaths £948, internal decorations £4,674, external decorations £1,014, fireplaces and grates £587, dustbins and line-posts £277, garage repairs £4, special repairs £305, sundries £19. The repairs fund made up of a £10 contribution in respect of each house showed a surplus of £1,549. An average of £11 was spent on 797 pre-war houses, £5 on 712 post-war houses, and £37 on 50 prefabricated bungalows. On March 31, 1957, the town’s debt for housing was £1,408,567, out of a total indebtedness of £1,483,383. This worked out at £85 7s 4d per head of the population for housing and £4 10s 8d for other purposes. Net rent income for the year was £64,110, and the tenants also paid £29,281 in rates. Total general rate income at 18s 6d in the £ was £174,683 but £93,873 of this was passed on to the County Council. Officers’ salaries cost £22,827 and the workmen’s wages £36,729. The swimming baths had an income of £375 against an expenditure of £1,049, Spencer Park £410 against £2,403, Rushden Hall £302 against£974, Jubilee Park £5 against £542. Open spaces cost £967 to equip and maintain. There are items of £224 for street nameplates, £21 for bus barricades and stops, and £24 for public clocks. RUSHDEN Society has been awarded a contract for the internal decoration of 64 houses for the U.D.C. The annual review of Rushden Urban Council’s housing programme has shown that the sites at Spinney Close, Newton Road and Cromwell Road will probably be sufficient to sustain the 1964/1965 building programme. The housing committee reported at last week’s council meeting that it would be desirable to make provision for constructing roads and sewers on the Spinney Field site in the early part of 1964 so that facilities would be available for future expansion of the housing programme. The owners of 28/38 Pemberton Street are to be served with notices to carry out the work necessary to make the houses fit for human habitation. The public health inspector reported that he had received no reply to informal notices requesting repairs of the premises. In the meantime, no work had been carried out on the houses. The notices will require the owners to make the necessary repairs within 56 days from the time of issue. The final cost of tiling the public conveniences in Newton Road was £292. These conveniences had to be closed for a few days during the cold weather because of frozen and burst pipes. RUSHDEN Urban Council on Wednesday approved a housing committee recom­mendation to enter into five contracts for the external painting of 206 houses. The "Echo" understands that houses in Newton Road, Oval Road, Grafton Road, Blinco Road, Short Stocks and Mallory Close are in­cluded in the scheme. The council accepted the five lowest tenders of seven in the following provisional sums: Mr. A. K, Luck, 92 houses for £1,104 10s. ; Mr. H. Underwood. 48 houses for £576 5s. ; Mr. G. S. Green, 12 houses for £183; Mr. H. P. Wilson, 22 houses for £341 10s. ; and Mr. J. L. Green­wood, 32 houses for £320. Over 50,000 homes have been built in past twenty years. Figures released by the Ministry of Housing and Local Government in its Housing Returns for England and Wales, shows that more than fifty thousand houses have been built in Northamptonshire since the war. The number of houses built at Kettering by the local authority by September 30 was 1,940, with 24 under construction. Privately built houses totalled 2,200, with 215 under construction. At Higham Ferrers, 310 houses were built by the local authority and 310 privately. There are now 25 private houses under construction. In Burton Latimer, the local authority built 353 houses with 29 still under construction, and privately built houses totalled 202, with 98 still under construction. Desborough local authority built 230 houses and has 34 under construction, and there were 225 private houses built with 37 under construction. The local authority at Irthlingborough has completed 376 houses and has 21 under construction, and privately built houses numbered 206 with 17 under construction. Seventy-two houses were provided by a housing association. At Oundle the local authority has completed 208 houses and has 29 under construction. Also, 81 private houses have been completed and 14 are under construction. At Raunds the figures were 228 completed and 24 under construction by local authority, and 313 completed with 64 under construction for private owners. Rothwell local authority has 313 completed and eight under construction, and 117 private houses completed with eight under construction. A housing association provided 12 houses. At Rushden, the local authority has completed 970 houses with four under construction, and 1,049 private houses completed with 100 under construction. The Wellingborough local authority has completed 1,922 houses and has 173 under construction. 1,786 private houses have been completed, and 78 are under construction. Corby Urban Council built 2,929 houses and has 12 under construction. The Development Corporation completed 5,688 and has 426 under construction. Private houses in Corby total 803 and 109 are under construction. Kettering Rural Council has completed 877 and has 26 under construction, and in the rural area 453 houses have been completed with 88 under construction. Oundle and Thrapston Rural Council have completed 869 with 22 under construction. Private houses completed total 392 with 70 under construction. Wellingborough Rural Council has completed 957 with 18 under construction, and completed private houses total 710 with 110 under construction. In the county between January 1, 1955, and June 30 this year, 6,331 unfit houses were demolished. The estimated population of the county at mid-1964 was 417,000.